It’s very typical for our advisors to have clients where one spouse works in the private sector and the other works as a federal employee. And in addition to managing the bulk of their money, the advisor often tries to help these clients figure out how best to allocate money in a Federal Thrift Savings Plan. 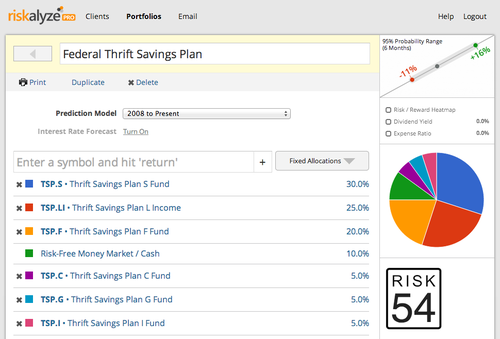 Today, we’re excited to announce that we’ve added the proprietary funds used by the Federal Thrift Savings Plan to the Riskalyze platform. Advisors can simply use those funds like any other publicly traded symbol, and design a portfolio that fits the client’s risk tolerance. We’ve created a Knowledge Base article with all of the fund symbols. In addition to the ones depicted above, we also have the target date funds on the platform. These funds are now live in all Riskalyze Pro accounts. If you’d like to see this in action, click here to join a guided tour.